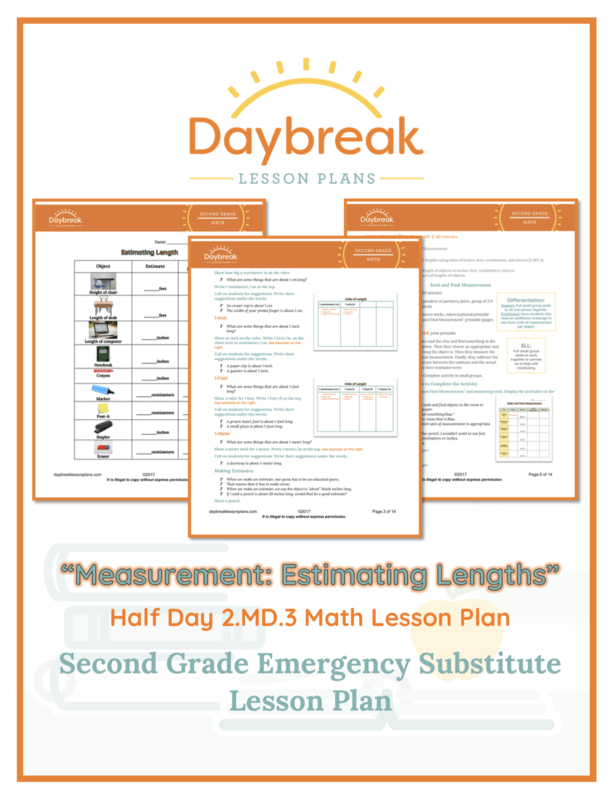 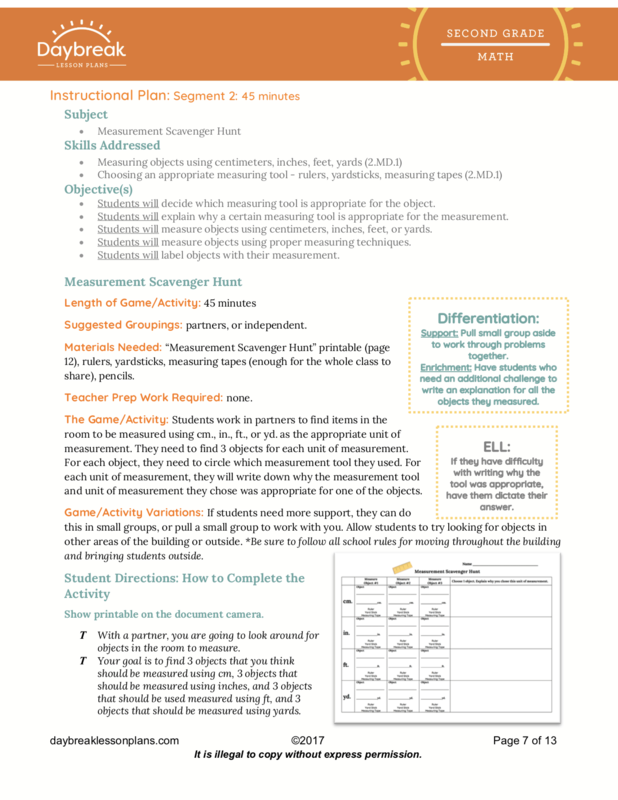 Description: This half day lesson plan is broken down into 2 separate segments (60 minutes each) addressing Measurement and Data: Estimating Lengths (2.MD.3). 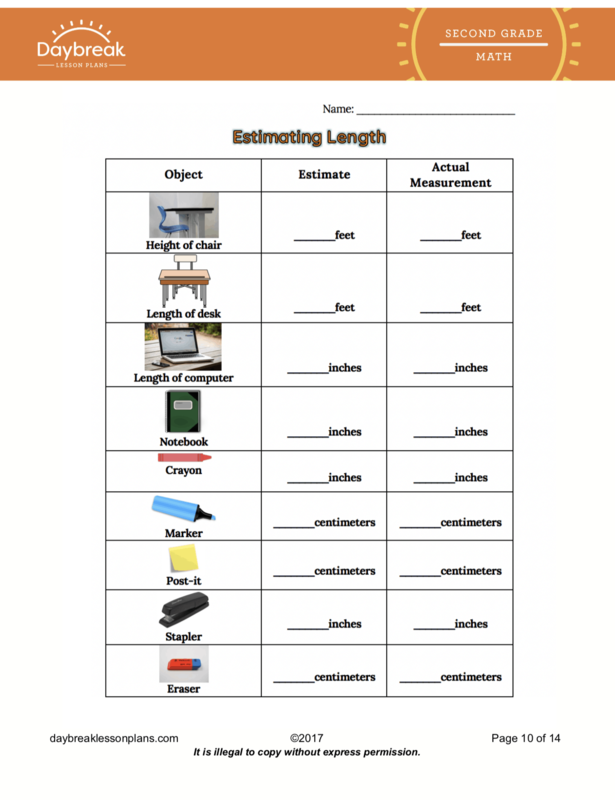 These lessons include: key measurement vocabulary, guided and independent practice of concepts, and an activity to reinforce the concept of estimating lengths. 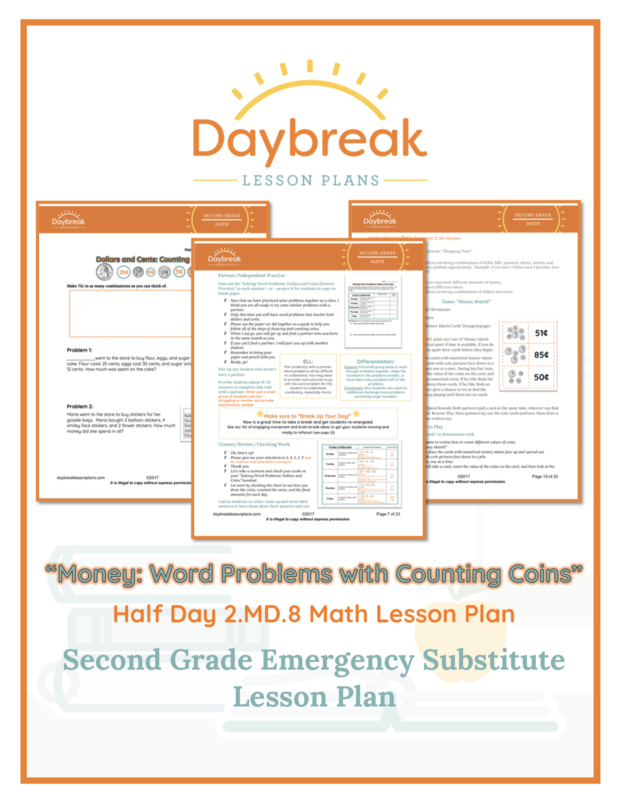 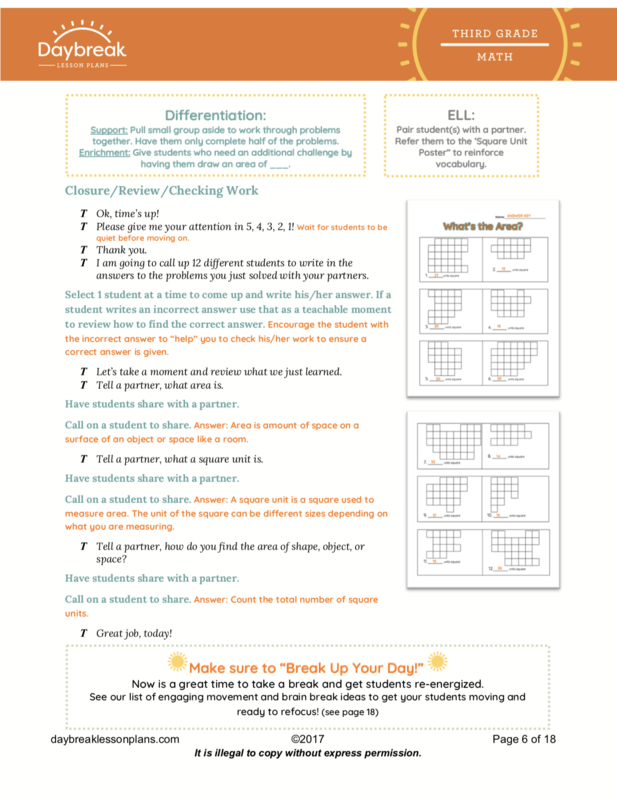 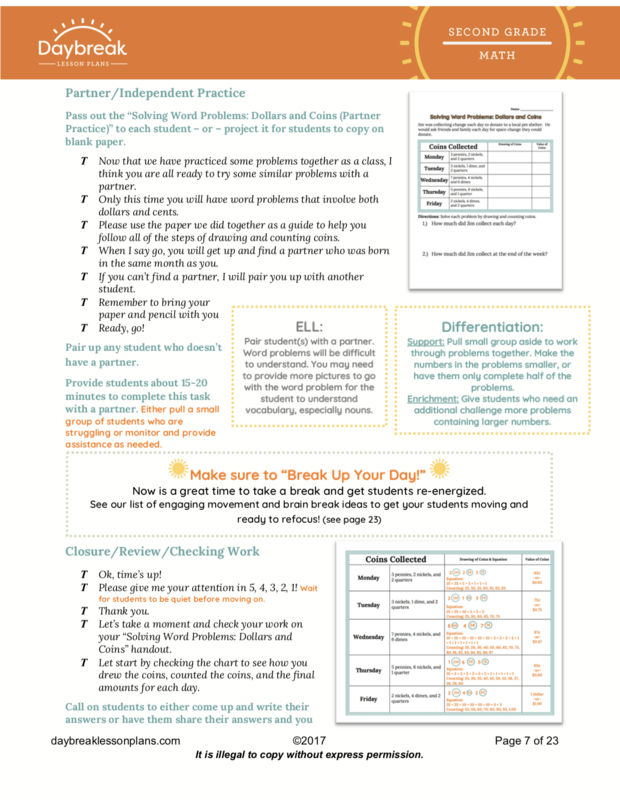 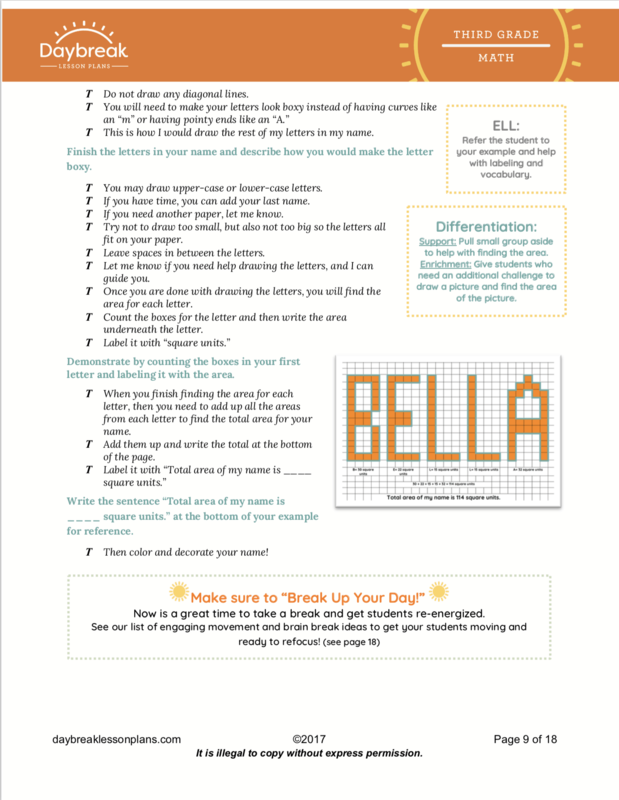 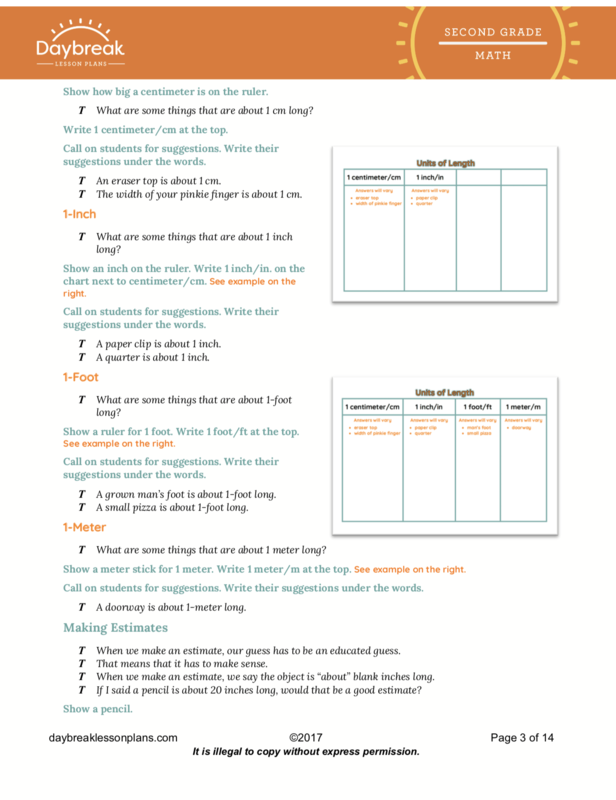 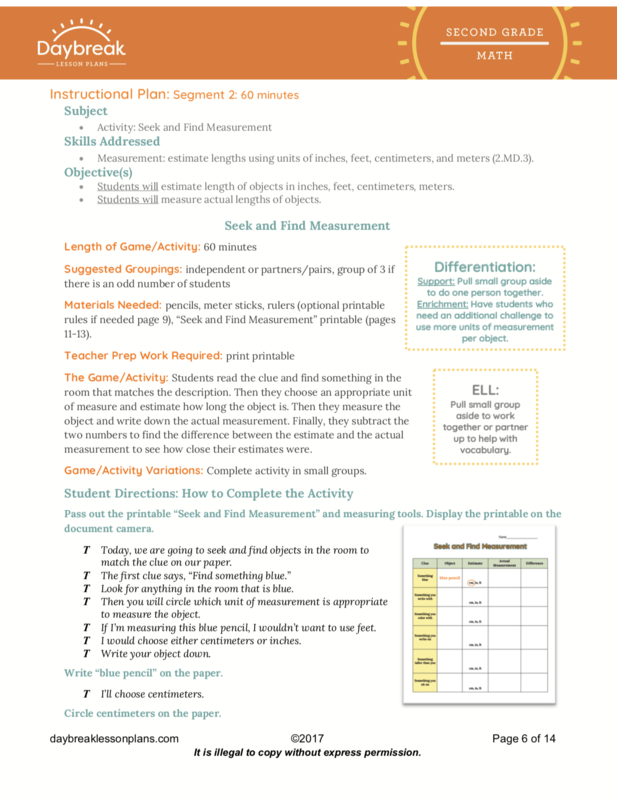 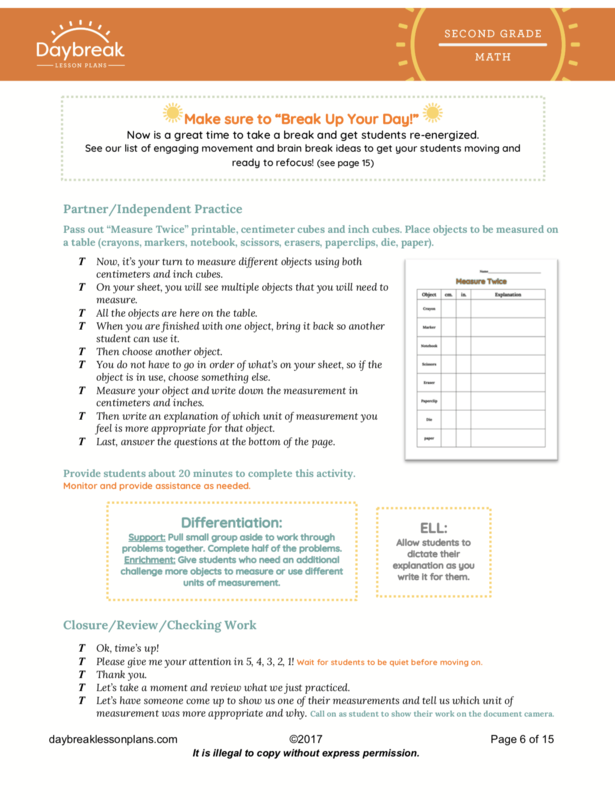 Description: This half day lesson plan is broken down into 2 separate segments (60 minutes each) addressing Measurement and Data: Solving Word Problems Involving Money (2.MD.8). 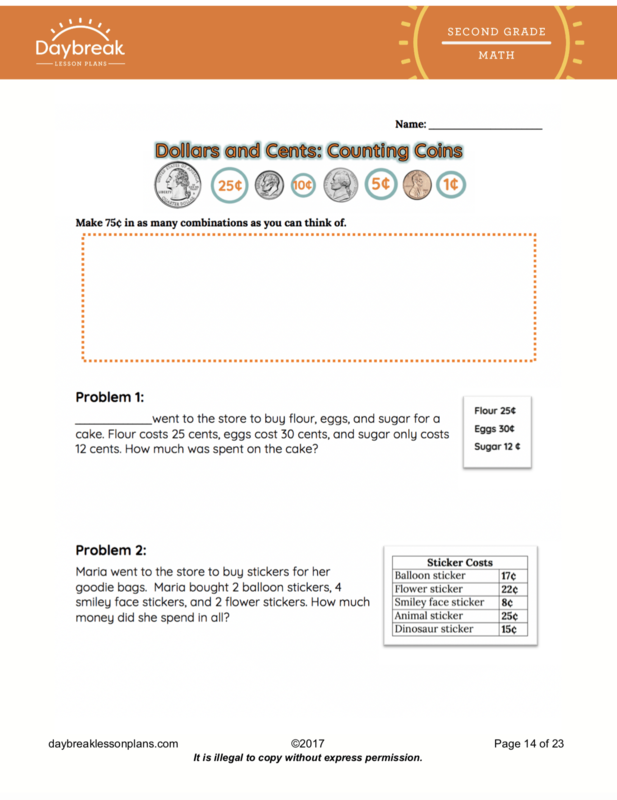 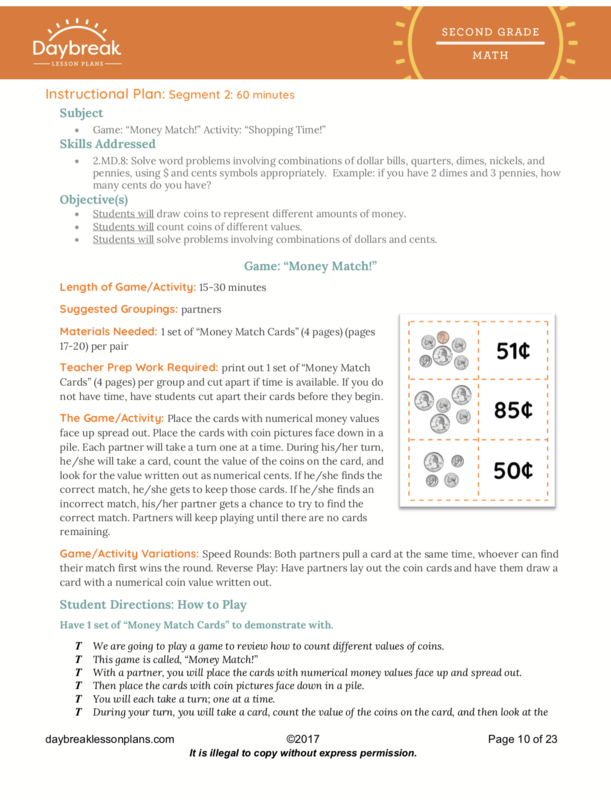 These lessons include guided and independent practice of concepts, and a game and complete an activity to reinforce the concept of counting coins and solving word problems involving money. 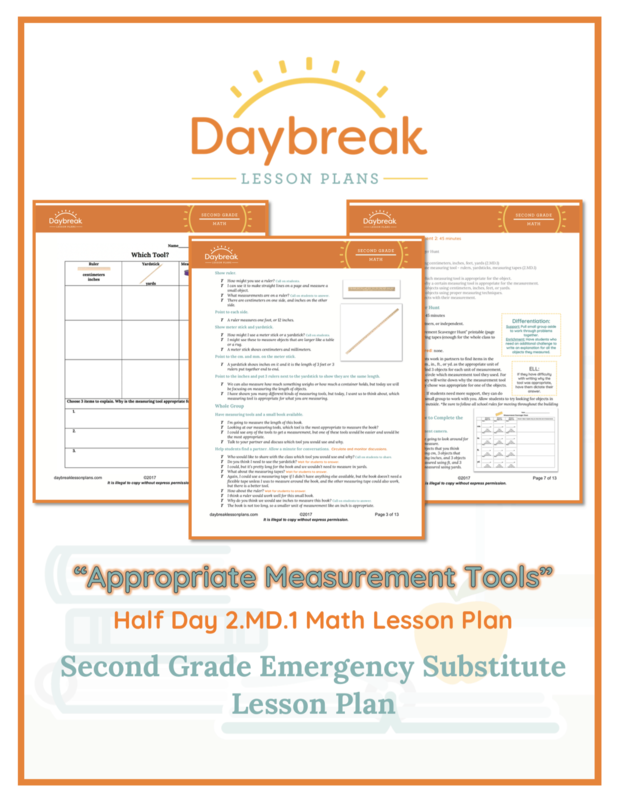 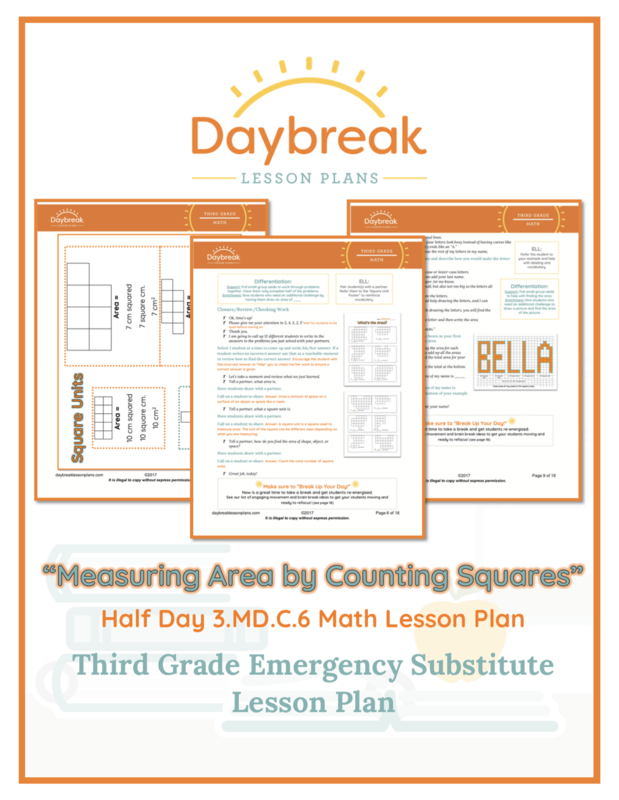 Description: This half day lesson plan is broken down into 2 separate segments (45-90 minutes each) addressing Measurement and Data: Area (3.MD.C5 & 3.MD.C6). 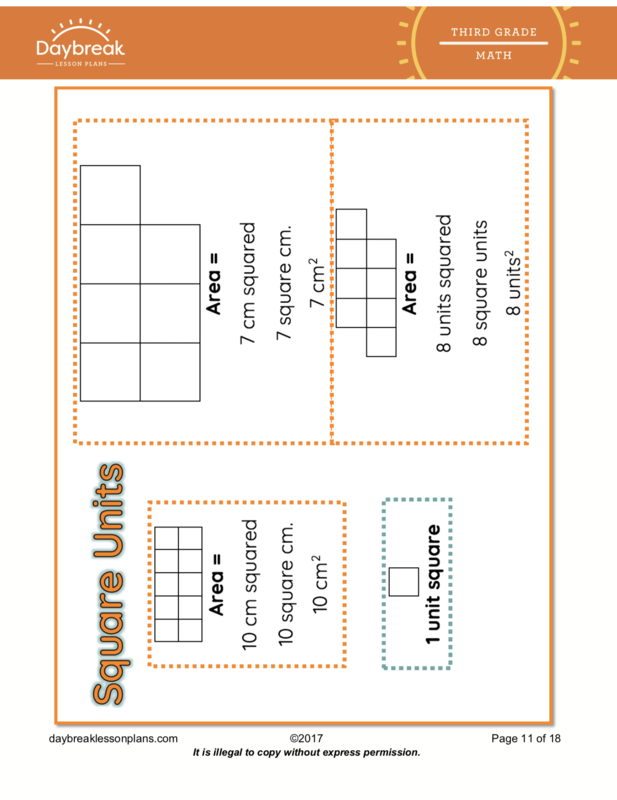 These lessons include: key area vocabulary, guided and independent practice of concepts, and a game to reinforce the concept of finding area in square units. 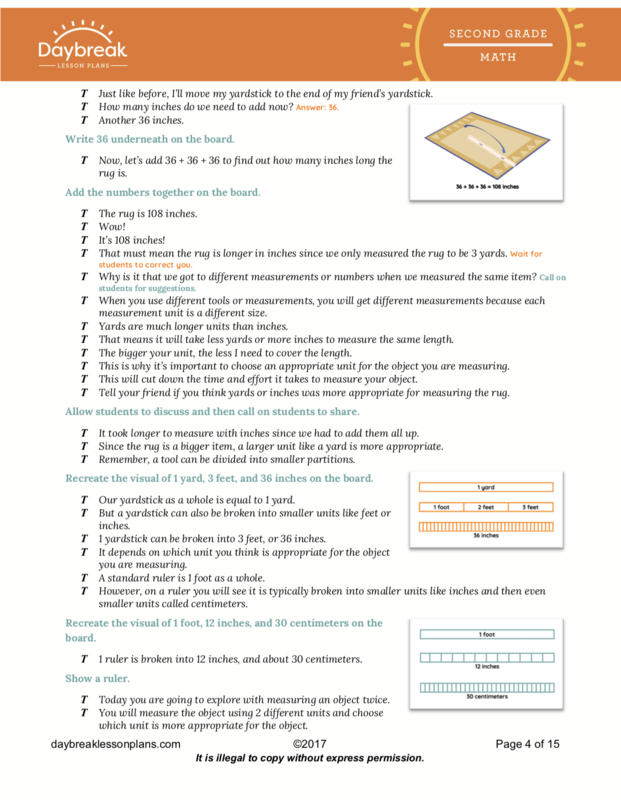 Description: Students will measure an object twice using different units of length and compare how the two measurements are related to the size of the unit chosen. 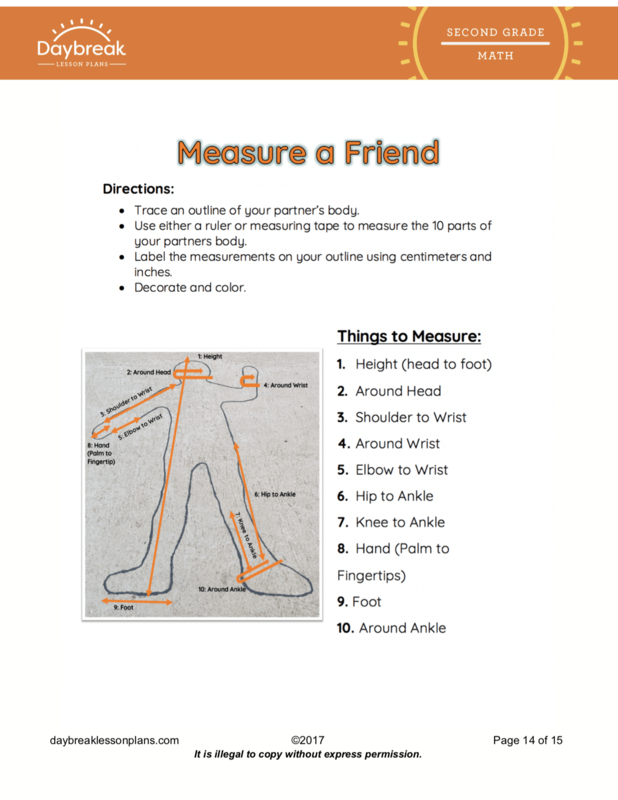 By measuring a friend, they will demonstrate in "real-life" the relationship between the size of the unit and the number of units required to cover a length. 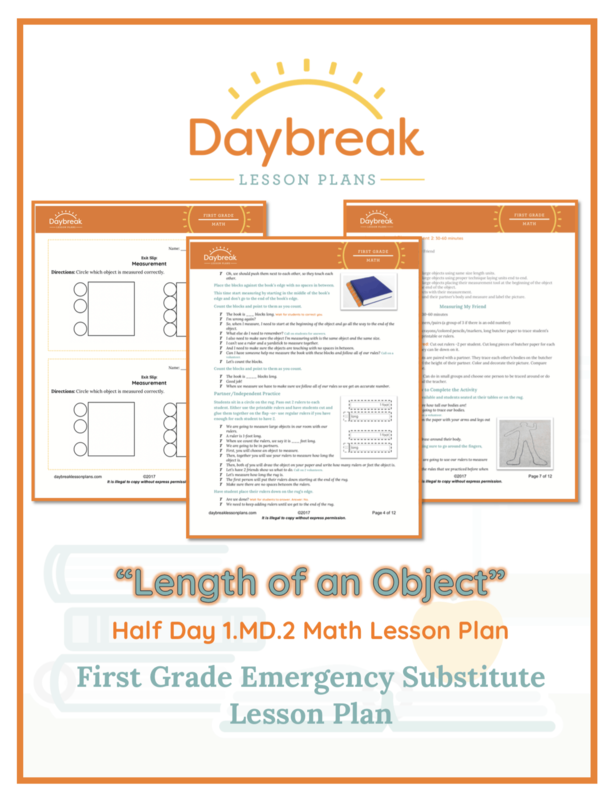 *This 1-hour plan is included in another bundle. 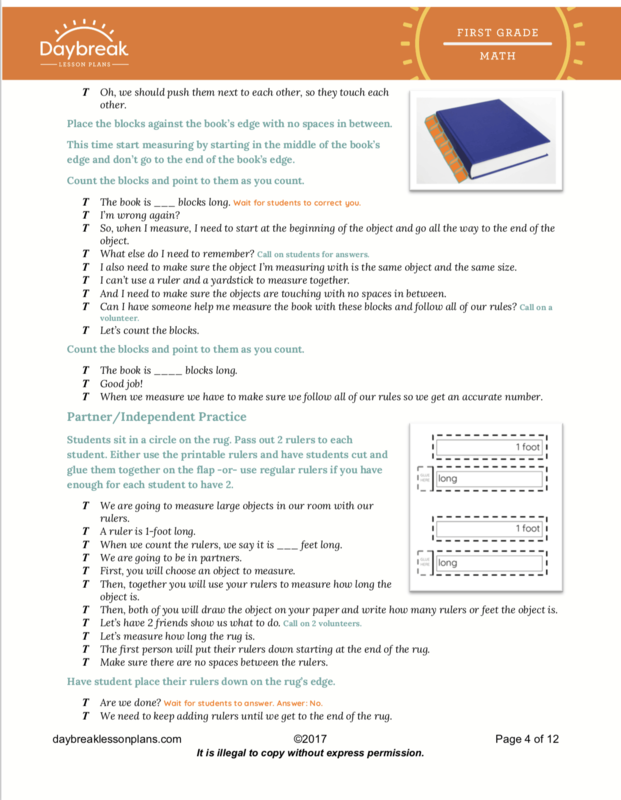 Read more for details. 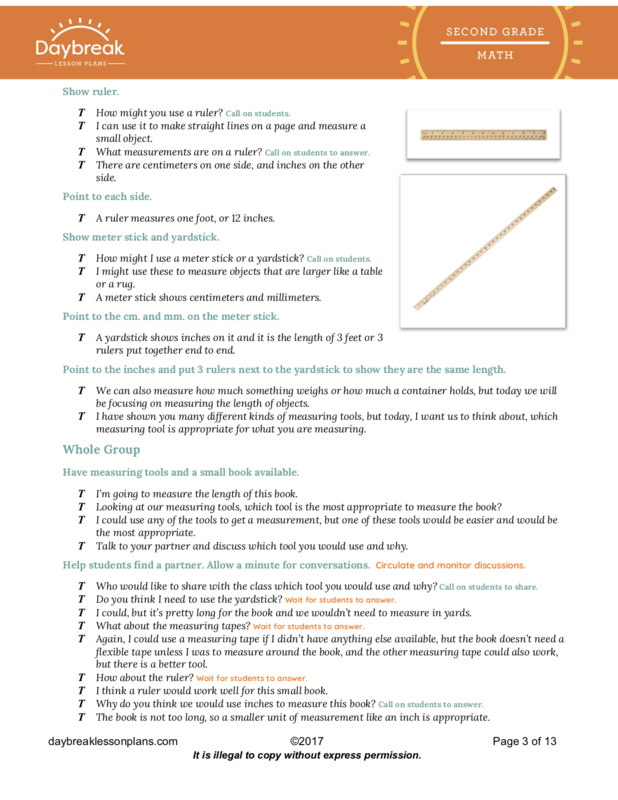 Skills: Measurement and Data, Measuring Objects using Centimeters, Inches, Feet, Yards and Choosing an Appropriate Measuring Tool - Rulers, Yardsticks, or Measuring Tapes. 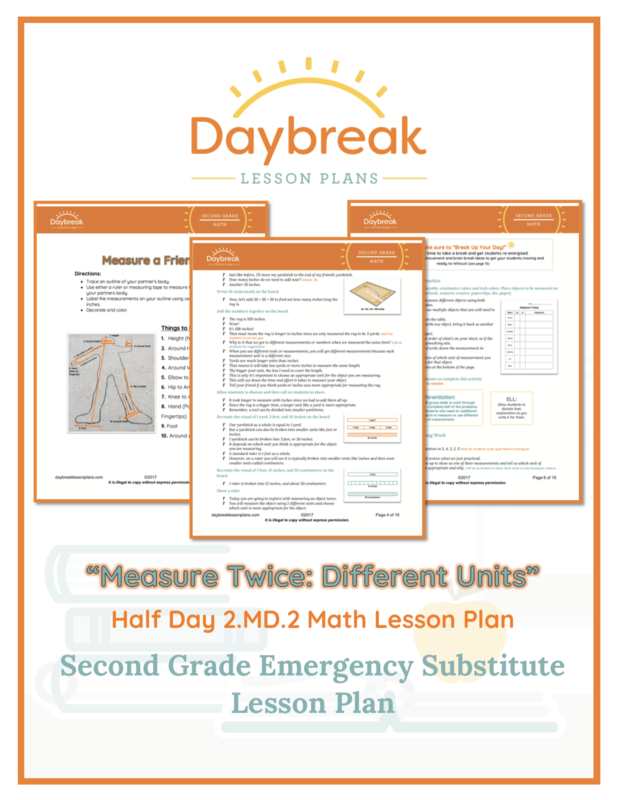 Description: In this fully-scripted, 2nd grade math lesson, students will measure and choose the appropriate measurement tool for centimeters, inches, feet or yards. 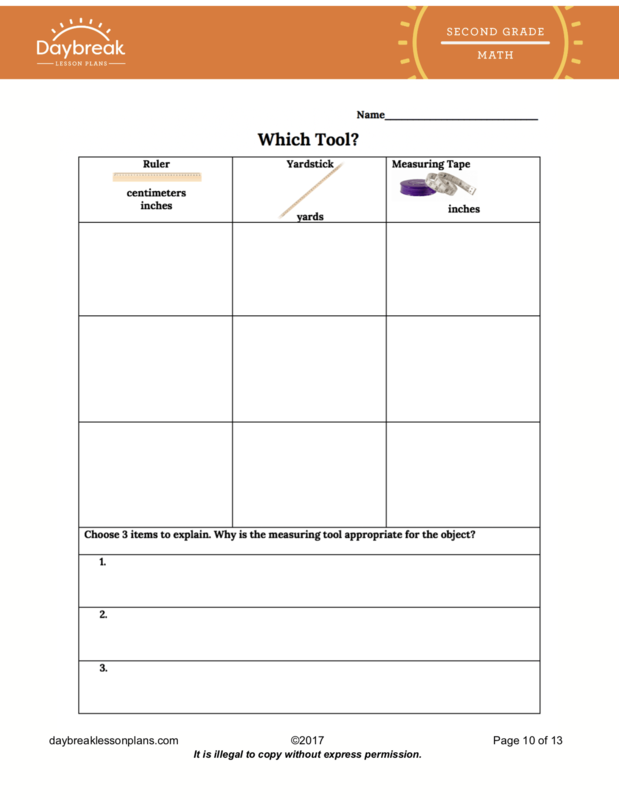 Working in collaboration with partners, they explain why each tool was chosen, and demonstrate their understanding of this skill by playing a Scavenger Hunt Game. 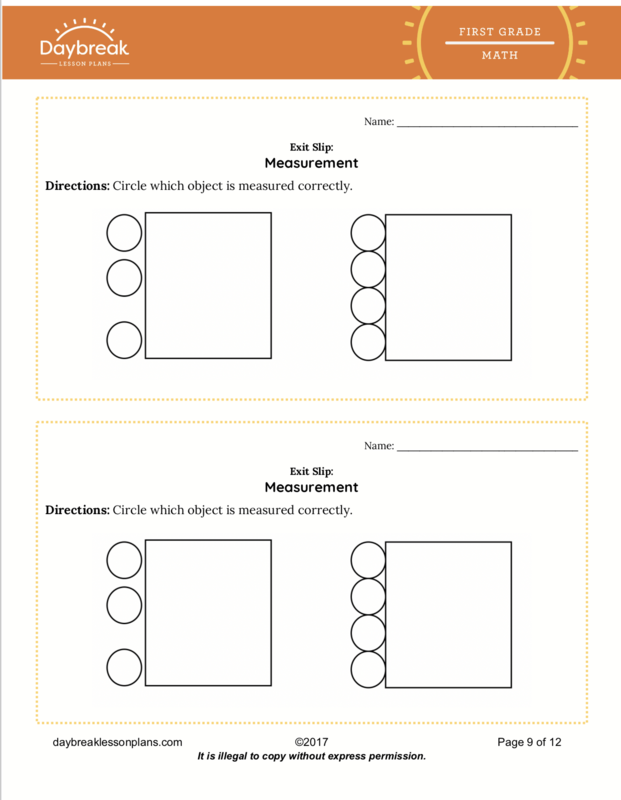 Description: In this 1 and 1/2 hour math measurement and data lesson, 1st graders will have the opportunity to use proper measuring techniques for objects of the same length as well as label the objects with the measurements. 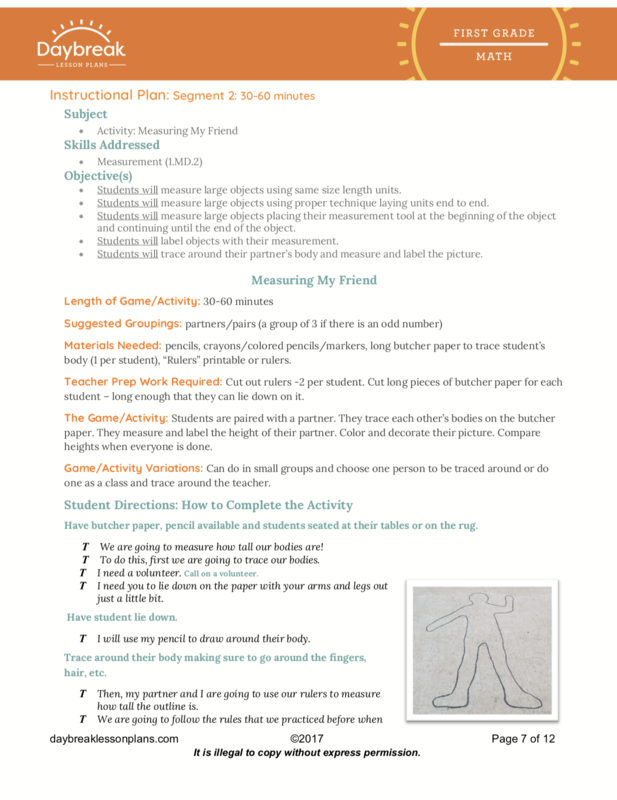 Also, they will work collaboratively with a partner to trace around their partner's body, measure and label the pictures of themselves.